During the first year together we mainly went on trail rides. 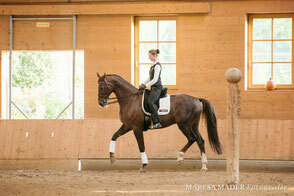 But at some point, I started taking lessons with a classical dressage instructor. During the third lesson, a winter evening, freezing cold and snow sliding from the roof, the instructor thought that sending a spooky horse forward in a brisk trot would help - only it didn’t. Asfaloth bucked, not normally his escape path, and had me hanging on his neck until I couldn’t hold myself anymore. This resulted in a broken scapula and a decision to stop taking lessons. Luckily at this point in time, I already had Alexandra Kurland’s books and DVDs at home and decided that this was the moment for exploring clicker training, which I continue doing to this day. I also continued learning about classical dressage without taking lessons and discovered Anja Beran. 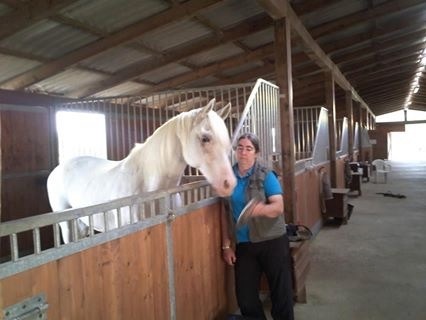 During her first workshop in 2011, Anja presented a number of horses that came to her with severe problems. For example, the Frisian stallion Gawain had a slanted hip and dragged his hind leg in the sand. His future seemed to be a pasture buddy in the best of circumstances. Yet, after 1.5 years of training, the hips became even and he now performs piaffe, passage and flying changes. And there is Flamingo, a warmblood gelding who, as a young horse, suffered an injury and forceful training with draw reins. Veterinarians would expect him to be lame if they saw his x-rays, yet he is clear and performs all the advanced dressage movements. And she presented senior horses that are still ridden and in a very good shape. As a matter of fact, all horses that were presented came with baggage but you could not detect these background stories in the horses Anja presented. They moved beautifully and in harmony with their riders, a pleasure to watch. All these horses were close to being put down, something you can’t imagine if you see them now. Good training has saved them and improved their health and welfare. 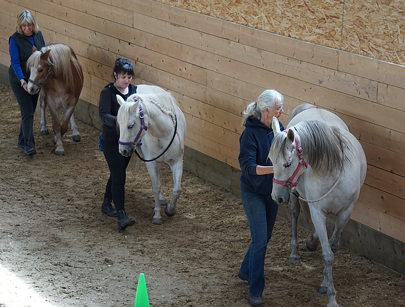 I was so impressed by this therapeutic riding skill, that I decided to learn from Anja. The way she uses riding literally heals horses. The horses begin using their body in a healthy way, build strength, mobility and balance and become calm and trusting. I had found my teachers: Alexandra Kurland and Anja Beran. Both care for horses deeply and value thoughtful training that benefits the horse first of all and results in physical and emotional balance (read the interview with them here). The things I learnt from Anja in the early years were not yet directly applicable for me and Asfaloth. We didn’t have the foundation in place. But it helped me to create an image of movement that I could aim for in my training and gave me a goal. So, I built the foundation with clicker training which is the most wonderful way to train the component pieces for any direction you want to go with your horse. It creates a wonderful relationship and enables you teach anything with horses that enjoy the process. But it also makes you question many things that you have previously learnt and accepted. You start asking yourself, if your horse really enjoys being ridden or if are you still pressuring him to comply? Can you be a clicker trainer and a rider? Both things that I enjoy very much. How can you combine this? Can you put a saddle and bridle on a horse without creating discomfort? Can I add my weight on a horse’s back without making his back ache? Can I use my body, legs and hands in a way that does not create negative emotions that could destroy the relationship that I am trying to build with my horse? And as much as I may enjoy it, what is in it for the horse? I believe that you can combine it and that our horses can enjoy and benefit from riding. And obviously, I do not simply mean relief from something he tries to avoid. What could riding offer that my horse may actively seek? Can riding provide positive reinforcers for the horse as well? Apart from giving the horse a food treat for a task well done, what else is in it for him? 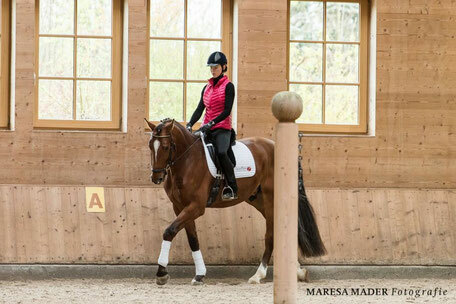 There is a lot in it for him: riding at its best can improve how a horse uses his body. He will find his balance and enjoy movement. One could argue that balance is a primary reinforcer. Balance can be the decisive factor whether a horse survives a predator’s attack or not. A balanced horse appears more confident and may have better chances to get access to food and mates in a herd dynamic. It is difficult to ascertain whether balance can have a reinforcing effect because you cannot just pull it out of your bag as a treat, unfortunately. Balance under a rider is very difficult to obtain and creating and maintaining it takes lifelong study. But I think it is safe to assume that horses will actively work to find balance and enjoy it when they found it. 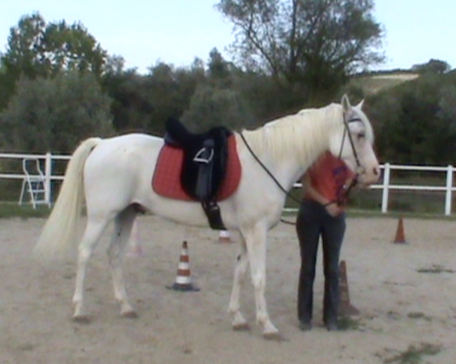 If you ride in the mind-set of a clicker trainer, you develop a dialogue between horse and rider. 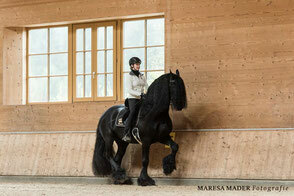 The horse can participate and you adjust your riding session based on your horse’s feedback. You do not force him do execute a certain movement, instead you set the scene and allow it to happen. And if it doesn’t happen, you think, change the setup and try again: immediately or at a later stage. Changing the setup could mean, in most cases, that you need to make adjustments to your seat. Get lessons in Feldenkrais, practice yoga or pilates, or take lessons from an opera singer for efficient breathing, whatever it takes to help you improve your seat. It could also mean, that you need to teach missing component parts. Say you want your horse to walk along the long side of the arena in a shoulder-in, does he know how to give to the inside rein? Does he know how to shift his balance to the outside shoulder? Is he able to yield the hips and step under with his inside hind? A good trainer does not force her way through the shoulder-in despite the horse’s resistance. You may test the waters by asking for the shoulder-in but if the horse tells us that he cannot do it, we stop and analyse what component part is missing. If we can add that part immediately, we can try again but if it requires training those parts, we commit time for training them before asking for another shoulder-in. A good trainer choses lessons that are beneficial for the horse. Shoulder-in is one of the key lessons to improve a horse’s balance and straightness. It is also one that adds safety for the handler and rider. It is a lesson that should be on a horse’s training list. There are a couple of component parts, that are all included in Alexandra Kurland’s Click-That-Teaches curriculum, even though she does not have a “Shoulder-in Lesson”. Shoulder-in, in combination with the other lateral movements, provide us with a tool set with which we can help the horse to develop healthy posture and movements. The four movements: shoulder-in, counter-shoulder-in, travers and renvers at the walk are all we need to improve balance and straightness. But to do this they need to be executed well. A well-executed shoulder-in can protect and heal damaged joints, but done poorly, it can destroy them. 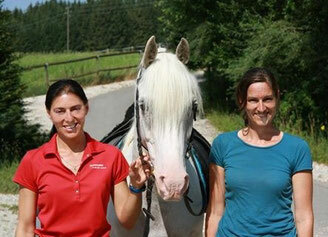 It is our job as trainer to know how a movement, that is beneficial to our horse, looks like. So, we don’t want to practice movements that are detrimental to our horse’s wellbeing. We want the gymnasticizing effect of a shoulder-in, not the one that jars the joints. But how can we build a new behaviour correctly, right from the start? How do you learn a good shoulder-in right from the first try, if you have never done one before? By doing our homework before starting the training. First, we need to analyse the movement: how should it look like in the end? Where does the movement begin? Which body parts are involved? What moves where? You need to know exactly how the movement looks like to be able to click at the right moment. Analyse the movement first and then develop a training plan. With regard to horses’ movements, we have a big advantage as compared to trainers of other animal species, as there is such a huge body of knowledge. 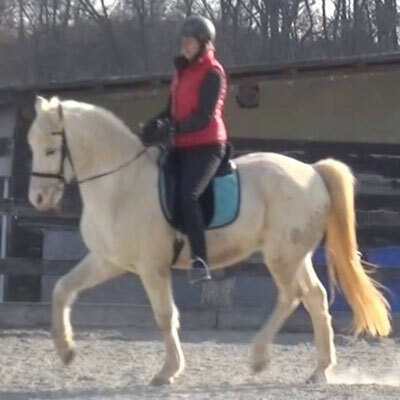 There are tons of books and videos on horse movements, with and without rider. Any movement you want to train, you will be able to find a detailed analysis. Studying the literature, you will also find which benefits each exercise can have on your horse. A valuable source of information are classical dressage books as they analyse the movements in terms of benefits for the horse’s balance and straightness. There are also plenty of modern books on anatomy and biomechanics that are useful. These books are all valuable to find the right exercises to help your horse. Another way of accessing that knowledge is by finding a very good trainer and observe her riding. This option is much more difficult, as really good riders and trainers are rare, unfortunately, but much better for your learning as you may be able to see the progression over time and the trainers can respond to your questions directly. Watching excellent riders will improve your understanding of healthy movements and it gives you a “gold standard” to compare to when shaping a movement of your own horse. It may take a lot of time and many hours of observation but eventually, you will be able to see differences and appreciate which movements you want to see in your horse and which ones you want to avoid. This skill is necessary when you begin training as you want to reinforce only those movements that you want to see more often. Now that you know how the movement should look like and how it “works”, you build it by thin slicing. You mark and reinforce the initiation of the desired movement and slowly shape the entire movement cycle. Ideally, you create clean loops of the desired movement and expand these carefully without practicing undesired movements. The more common approach in shaping would be to mark and reinforce approximations of the desired movement, laying out a gross pattern, and then shape it to the final behaviour. The latter approach would involve extinction and the horse may revert to these initial approximations movements at later stages, since they are now in repertoire. 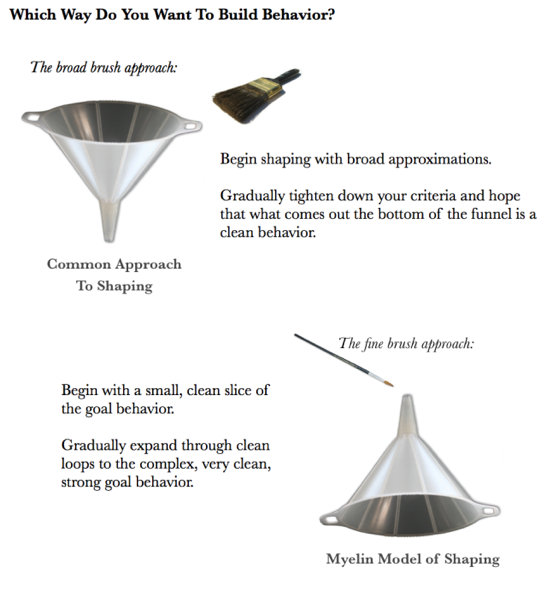 A better approach is the one that Alexandra Kurland describes as “Myelin model of shaping” (see her blog article Metaphors matter) where you begin with a small clean slice of the desired movement and expand the clean loops from there towards the complete movement. Taking the example of a shoulder-in, you may begin with a give of the jaw to the contact of the inside rein. When that loop is clean at a halt, you expand your loop to a give of the jaw in walk. As that loop is clean, you concentrate on the shift of balance in the shoulders, and as that is clean you try to get a small yield of the hips. Adding all of these component parts will result in a shoulder-in that is beneficial to your horse’s wellbeing. Approaching training this way, you practice movements that are all beneficial and you can always revert to earlier steps, should you get stuck somewhere along the way. The same principles apply to complex movements such as piaffe. The piaffe is a key exercise to close the horse and strengthen his back. There are many component pieces to this exercises that need to be established first, which is why it takes so long to get a good piaffe. It is a very beneficial exercise, if done correctly, and worthwhile pursuing as all the component pieces are already adding to your horse’s balance and soundness. As you progress in your training, adding in lateral movements, increasing mobility and straightness on the way to more balance, you will notice changes in your horse. He will look rounder and move softer. Movements in any direction or gait will become easy and available at any moment. He will become more serene and concentrated during the work. He may nicker as you approach with the saddle in anticipation of the physiotherapy session. And as you move along the progressions in classical dressage, even the piaffe is reachable. 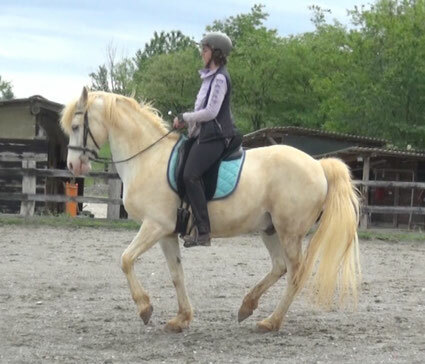 With all the preparations, it is only a small step and as our horses understand the movement, it will be a piaffe in self-carriage without strain that is fun for the horse and good for his health.